Perform Galileo’s Classic Falling Bodies Experiment in Miniature and Examine Newton’s Motion Concepts. You don’t need the Leaning Tower of Pisa to come to the same conclusion as Galileo about the relative speeds of falling objects — this handy device just needs the space between the bench top and the floor. 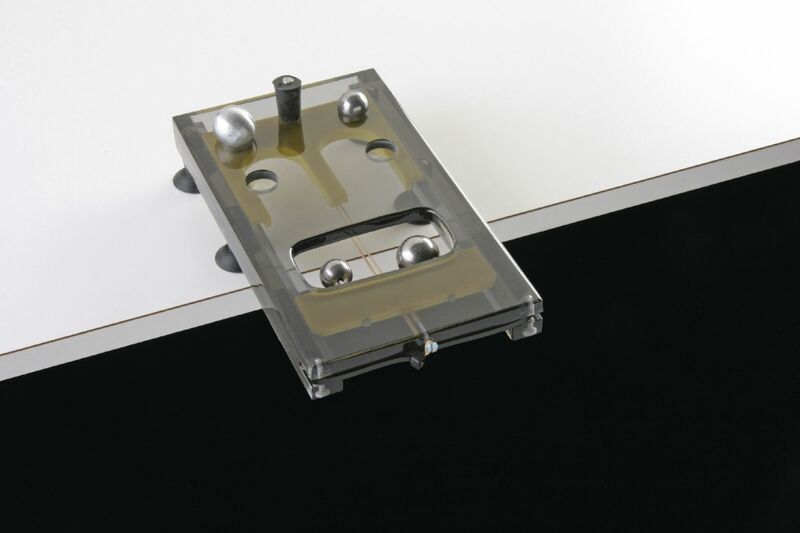 The apparatus is firmly held overhanging the edge of the bench by four suction cups. Two metal balls are suspended in a cutout in the base plate by metal pins attached to a slide. A second slide is held against the tension of a rubber band by a pin. When the pin is removed, the second slide rapidly pushes the first away from the cutout, releasing both balls simultaneously. Students observe which ball lands first. The apparatus is quickly prepared for a second trial, allowing for multiple observations in a class period. Further examination of the apparatus reveals concepts of acceleration, inertia, and collision. Includes two 3/4" steel balls, a 1" steel ball, and a 1" aluminum ball to allow size and density variations to be explored.